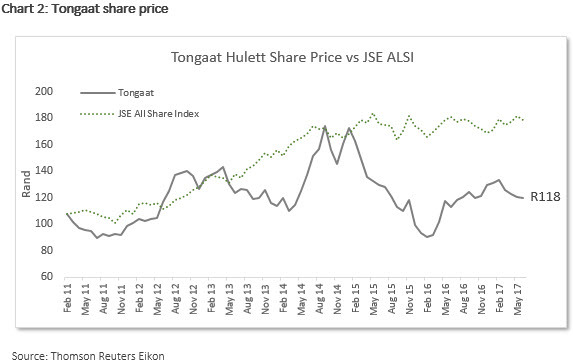 Agri business Tongaat Hulett ("Tongaat") is undergoing a turn in fortunes now that one of the worst droughts to hit Southern Africa in decades has receded. With an increase in sugar production and lower maize prices starting to filter through to earnings, its shares may well be in a sweet spot as a "drought recovery play". When evaluating the investment potential of Tongaat, it is important to note that the business’s operating margins and profits are heavily influenced by its ability to produce sugar. This is due to its largely fixed cost base� - which means that it is unable to cut costs in tough times in order to maintain its profits. The good summer rains (except for the Western Cape) received in the 2016/2017 season allowed Tongaat to return to growth with earnings up 37% for the year ending March ’17. 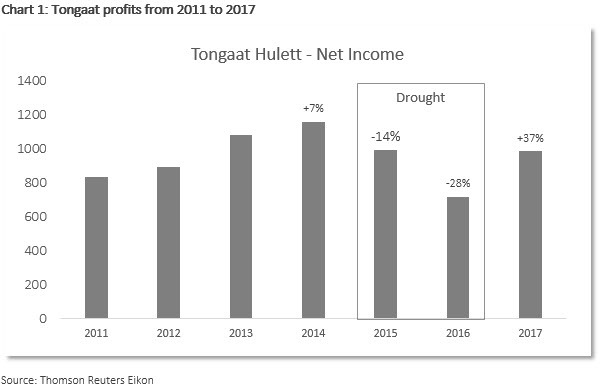 According to Tongaat management this reflects "an improvement in sugar revenue and operating profit under difficult conditions." Looking forward, management expects sugar production to increase to at least 1,155k in 2018 and at least 1,485k tons in 2019. This equates to a 43% cumulative increase in production from the low of 1,023k tons produced in 2016. The two other legs of the Tongaat business model are starch (positively influenced by a drop in maize prices) and the ongoing commercial conversion of its valuable land holdings between Ballito and Durban. While a little beyond the scope of this article, its land developments should provide a good support to earnings for many years to come, albeit at varying rates. Tongaat’s shares trade at R115 each after having recovered from a low of R80, but are still far off the high of R180 they reached just before the drought. Given a return to more conducive operating conditions, the company should earn closer to R10 per share in 2018 and if projections prove correct, it will earn north of R14 per share in 2019.